HiMedia help you organize and enjoy your digital media, So you can preserve your lifetime of photos and videos, and share your memories and experiences with anyone, anywhere. Active collections tree Categorize media by capture time, resolution, film roll, import history, people, places and other user specified 'field'. 3 ways to attach tags: 1.Drag-and-drop tags directly to media. 2.Attach tags while imported. 3.Type in tags or descriptions directly on keyboard. Multiple media thumbnail layouts and multiple views:Resizable thumbnail size, Flexible layout template, You can view every field and specify its position, View all media in one central location and Click to playback video. 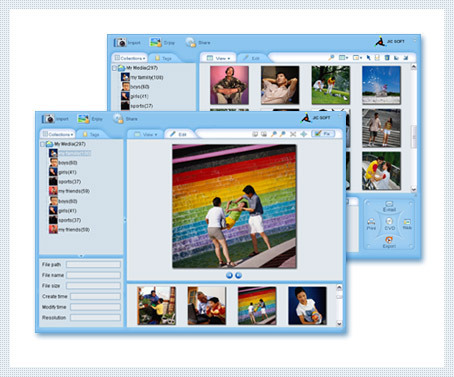 Management: 1.Automatically find and import thousands of photos and videos from your hard disc. 2.Store small proxy files; help you manage photos and videos on CDs or DVDs offline. 3.Backup thousands of photos and videos which spread off many folders to CD or DVD. 4.Support IPTC metadata, you can share tags with other people. 5.Monitor disc change, Sync with disc automatically. Enjoy instantly: Enjoy instantly while connecting with camera, Enjoy slideshow with music, transition effect, title effect and slideshow with thumbnail navigator. Fix photo: 1.Crop, resize, remove red eye. 2.Adjust brightness, contrast, saturation and lighting. 3.Other effects to enhance your photo. Trim/Split video clip: Scene breaks automatically, Combine multiple clips into one and Set key frame for video clip. Create: Tens of transition effects and title effects; Make thousands of photos with music, transition effects and title effects into VCD/DVD and Multiple web template help you easily build a photo gallery. Share: Print art album, contact sheet and Email photos to your friend.